Allow this HomeAware smartphone signal system package to wake you. Let the HomeAware smartphone signal system package alert you to what is going on. You might be surprised to know that the HomeAware also comes in a smartphone signal system version too. The smartphone signal system is particularly impressive. 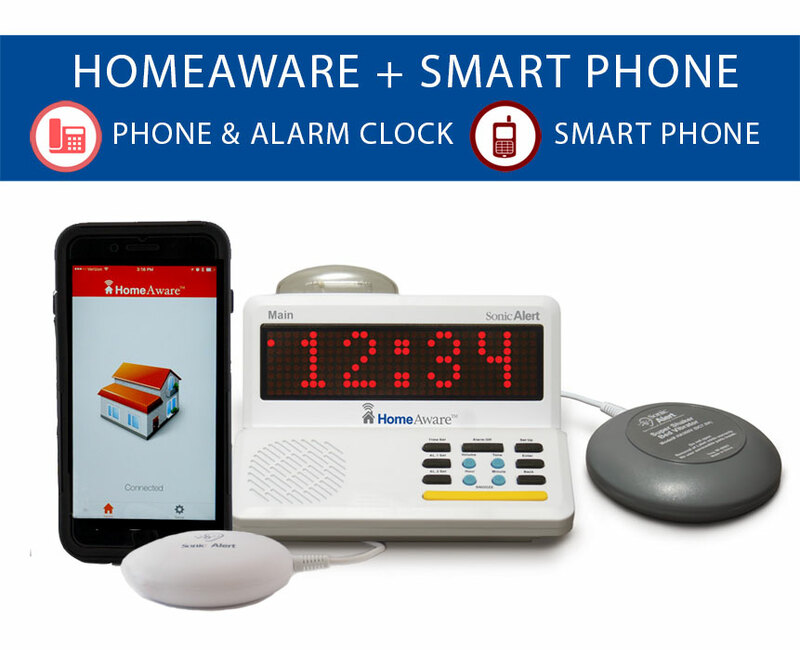 The smartphone signal system allows you to get alerts to and from your system to your smartphone via the HomeAware smartphone app. Via this smartphone app, you can also choose to receive notifications for things like text messages and emails. It displays this information on the signal system's two-inch scrolling display. The signal system works as an alarm clock with a bed shaker. The alarm on the system is 110 dB and has a flashing red strobe too. You can choose to expand the range up to 1,000 feet with additional receivers and add the Sonic Bridge unit, HA360BU, to connect old Sonic System remote receivers to your HomeAware. See how much this product can do? It's your turn now to outfit your house with HomeAware. Additional accessories include the HomeAware Deluxe Remote Receiver, the HomeAware Basic Receiver, the Smoke and CO (Carbon Monoxide) detection transmitters, the Baby Cry monitoring transmitter, the SonicBridge, and the HomeAware smartphone application.